Messing about on the water with some team building thrown in! 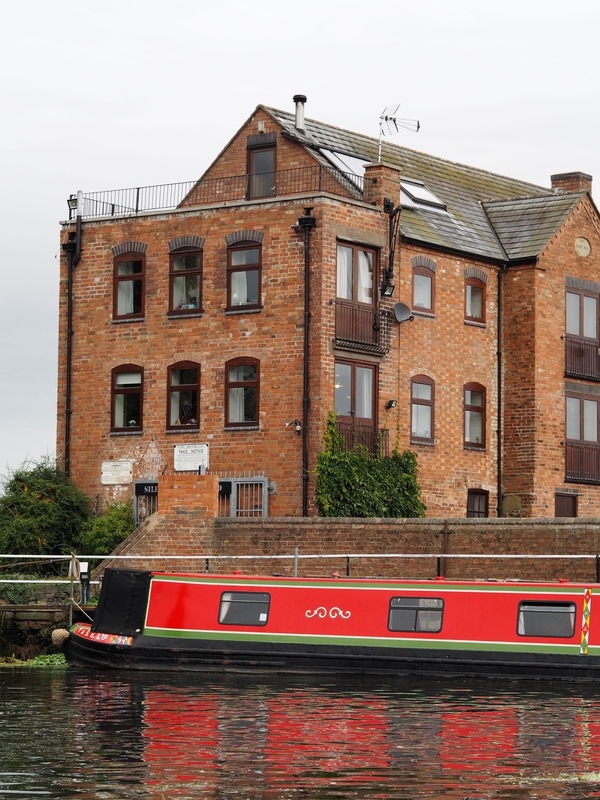 A few weeks back I went up and down the local canal. On a boat obviously. It was a team building mission you see. 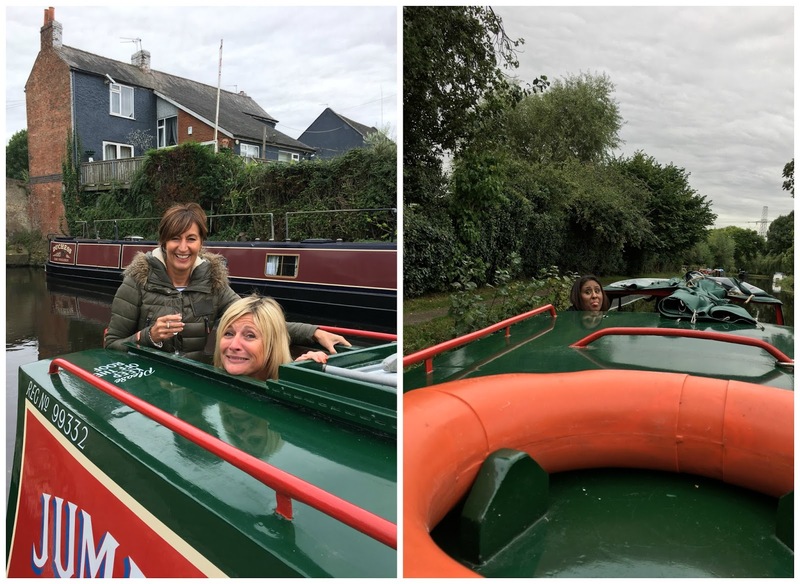 I work in a small office and our manager had the great idea of taking a narrowboat out for the day as a team building exercise. Not that we needed it because we work very well together and we all get on like a house on fire. But hey, I'm always up for a day out so my hand was first up! We'd had some really nice warm weather leading up to our adventure but what should happen on the actual day? How did you guess? Cloudy and drizzly which left us wondering which bright spark suggested a day on a boat on a dull, wet and extremely grey Saturday morning. Still, we'd packed food, alcohol, our team spirit, and hey we could stay indoors if it rained (apart from Captain Armin of course), all would be well. Captain Armin in charge of his vessel. The young man at the boatyard gave us the instructions on how to operate the boat, I say us but most of us weren't paying a blind bit of attention, Armin, Dea and Leisa were taking it all in though. He was with us whist we had a practice run at getting through a lock, then that was it, he jumped off and left us to it. Bloody hell, did he really trust this motley crew?! 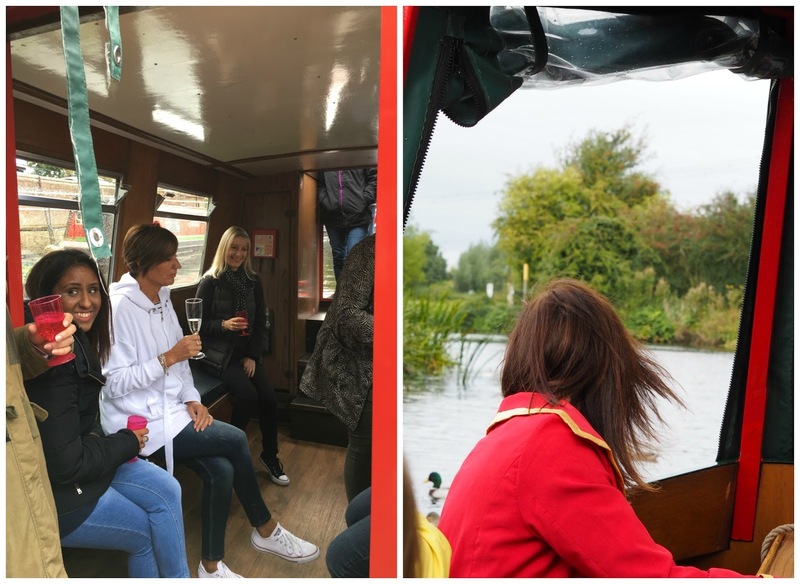 We were all in hysterics, I think just at the thought that we were really in control of this thing, erm.......watch out other boaters. We were all aboard, Armin was in control of Jumble and we were off. Leisa took charge of the most important thing, cracking open the first bottle of fizz. Priorities. Our young instructor from the boatyard told us if we got cold we could all huddle round the one gas ring but we had everything we needed to keep us warm in that there sink! Although dangerous when you've not had food. Leisa got us there with the promise of bacon and egg cobs, baps, buns, barm cake, rolls, whatever you may call them, they're cobs where we come from, she took our orders and everything but then turned up empty handed as the shop was bloody closed. Better research next time Leisa. Armin was doing so well, for five minutes, and then we found ourselves heading towards the grassy bank and slightly alarmed cows, although I'm pretty sure the cows are used to idiots like us chugging up and down the river every day. Backwards, forwards, backwards, forwards we went, and we were all peeing our pants which wasn't helping the situation at all and screaming at the poor lad which way we needed to go, like he couldn't see the way, he just needed to take firm control of his rudder for goodness sake. Shreya went to give moral support and after going round in circles (just kidding Armin) we were on our way once again. Well done to Shreya for passing the first team building test. The swans weren't impressed either. It wasn't long, about 15/20minutes till we were at our first lock (and pub) and I think we went into panic mode ever so slightly. Leisa had been told not to drop the lock key into the water as it would be costly and disastrous so she held on to it for dear life, until she got to drink 4 or 5 then it was "what lock key?!" Turns out this lock wasn't too bad if I remember rightly though as I think there was already a boat in the lock waiting for us (two can go side by side) so we didn't have too much work to do. There were no spaces left outside the pub to park our vehicle, so we went under the bridge and moored up the other side. A grumpy fellow boater passed by shouting that we weren't allowed to moor there as per the sign on the grass. Apparently it was just a pausing space for boats waiting in line to go through the lock. Oops. Oh well, we'd tied all up and needed a wee stop so pleaded ignorance and just left it there for a very short time. Sorry. Bladders relieved, legs stretched and still dreaming of our bacon and egg cobs we tucked into our picnic, cream cheese with a chilli dip, sausage rolls, crisps, scotch eggs, hams, crisps, olives and more crisps. Jeez.... I was longing for real food, dreaming of a delicious pub lunch, err..........which was on the printed itinerary that Leisa sent us, but nope, we didn't have time to stop for a hot lunch, had to keep going. Who needs food anyway? Now I was clever and used the loos at the pub, there was no way I was squeezing myself into the on board toilet facilities. If you could call it that. It was smaller than the loo on a plane and they're damn small, you literally had to reverse yourself in, and for some weird reason there was a lock on the outside of the door as well as the inside. Bizarre. 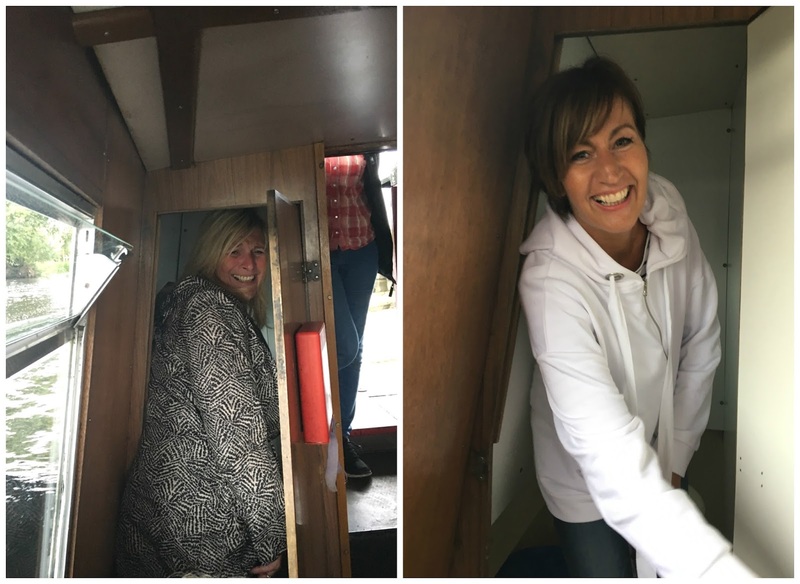 Leisa, Tracey, Amy and Lorraine were desperate and braved it with Lorraine ramping up the team building by holding the door for Leisa who declared that she would have a panic attack if the door was fully shut. We drank a little more, okay quite a bit more and carried on chugging down the river. We had music playing so we could sing and dance as a team. I think it was at this point we noticed that our Captain had abandoned his post to get another drink. Hmmmm.......what happened to "I won't drink much I promise" Too interested in what was going on below deck me thinks. We didn't need to panic though as Dea had taken over. I think she had a sixth sense about what would happen with Armin so she didn't drink. Good job one office member had their sensible head on. All the boats that passed us wanted to be on our party boat, you could just tell, some even asked if they could come on board but there was no room at the inn. Sadly before we knew it it was time to head back (although we really hadn't got very far at all) and we were all so disappointed as we were having so much fun. Dea swung Jumble around, like a boating pro may I add and took us back to the first pub we stopped at on the way out. Can't hide the fact that a few more beverages were consumed at the pubs only because A) It was the weekend and B) It was a Saturday. Good enough reasons. We managed to get through the day with no rain and we didn't care that it was a grey day, as you can see by the un-edited pics, it didn't dampen our team spirit one bit! Are some of you just thinking this was one big piss up? Thought so. Well you're wrong. No, you'd be a little bit right. Yes it was a piss up, BUT there was plenty of team building involved let me tell you. We helped each other with the tough locks, we helped each other with throwing the ropes and tying up Jumble, we helped each other on and off the boat, we had two injured members of the party, one with a dodgy foot and one with a dodgy back, so we pushed and shoved them on and off where necessary, we all worked together at shouting out directions, helped each other in and out of the loo and we poured each other drinks :) all whilst perfecting the art of dabbing. Google it. Our office consists of two small teams that were put together so joking aside, this day out really was a chance for us to gel and get to know each other a little better. Let's face it some days are tough at work and there are days when we don't all see eye to eye, I guess that's office life, well, life in general, and we've not been on any day or night out together so this was great for us all. Leisa was the bright spark that suggested the boating adventure and we're all so pleased she did, because it turned out to be the best day. Round of applause for Captain Dea for getting us all back to base safely and in one piece! 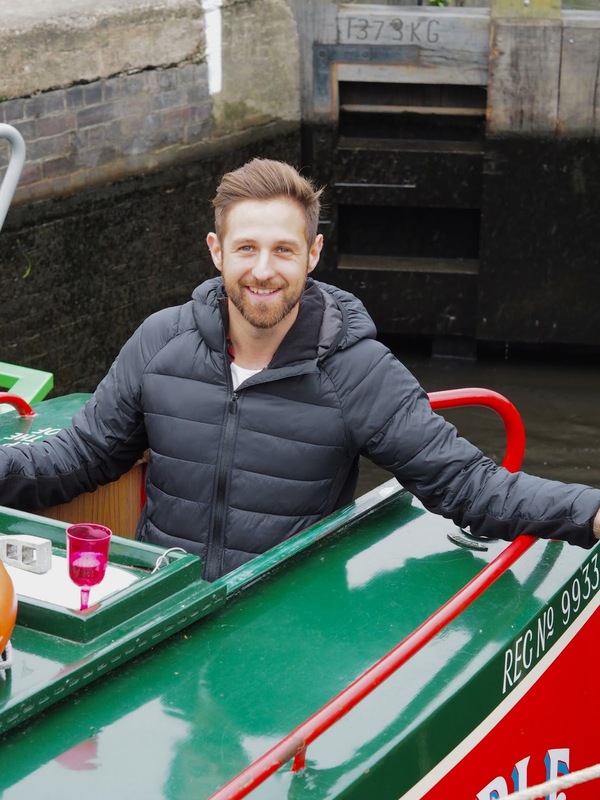 Have you been on a narrowboat?